In just seconds, our Excel Translator easily converts from a rollator to a wheelchair and vice-versa. 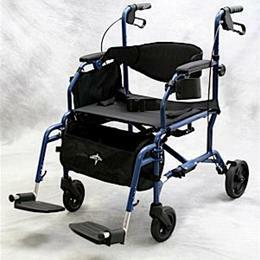 The Excel Translator allows rollator users to sit down and ride in a wheelchair when their legs get tired. And, wheelchair users can stand up and walk along when they want to get more exercise. Best of all, you only need to own one piece of equipment, rather than two. It comes with a convenient cup holder, under-the-seat basket, zippered side carrying case, and easy-to-adjust push button foot rests. You'll be delighted with the comfortable, spacious seat which is more than 75% roomier than the average rollator seat.